The celebration continues with TRIVIA!! 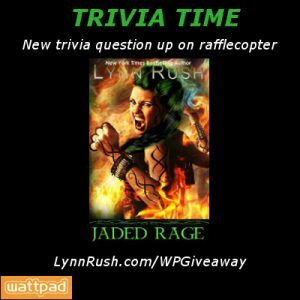 We just added a trivia question to the Rafflecopter that’ll earn you five more entries. CLICK HERE to check it out! Thank you, again, for reading Jaded Rage and all the support you’ve shown me on Wattpad! And stay tuned for more chances to win some fun prizes! This entry was posted in Wattpad by Lynn Rush. Bookmark the permalink.